The story of the making of Deep Purple’s classic album MACHINE HEAD and the worldwide rock anthem SMOKE ON THE WATER. Join the mailing list using the button below to keep up to date on this forthcoming title, now due Spring 2019 to mark the 50th Anniversary of the line-up. For those who missed the original DEEP PURPLE IN ROCK book in this series, this has been reprinted and can be ordered (there is also a new German edition out). NEW Flipbook preview of the book. 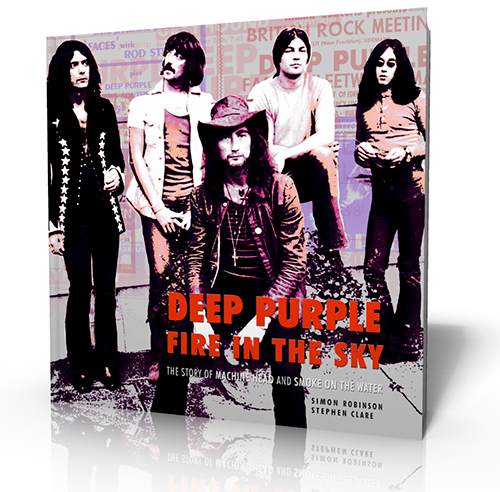 FIRE IN THE SKY is a new book which looks in detail at this important period in Deep Purple’s history and the making of their break-through album MACHINE HEAD. 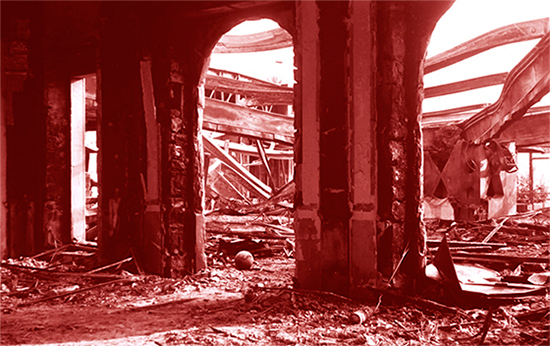 While the fact that a fire destroyed their original recording venue is well known to most music fans, the book detours to look at the cause of the blaze, talking to people who were at the show, and gets to the bottom of just what were Frank Zappa’s last words when he dashed off the Casino stage as the roof burst into flames? And in these times of economic hardship, isn’t it inspiring to know that punitive tax rates back home were responsible for Deep Purple being in Montreux in the first place? This book looks back at the events which led to Deep Purple’s bizarre and Heath Robinson-esque Machine Head hotel recording sessions in the winter of 1971. And as for that “hit to be”, Smoke On The Water was not even tried out on stage, and might never have been played live at all were it not for a request from the BBC for a radio session. It went on to sell 12 million copies and is probably the only gold disc ever made to actually be presented to a city. And yes, there really is a music shop in London which threatens to fine budding guitarists should they dare to try out the riff in-store. The story takes in the subsequent debilitating American tours where Machine Head quickly became a massive selling album, even as the relentless gigging pulled the band apart. We have spoken to Roger Glover at length recently to get some unique recollections, while memorabilia and many rare and unseen photographs illustrate the story, including remarkable images of the Casino fire and aftermath and Ian Gillan with his notepad writing the lyrics in the studio. The music, gigs and lyrics are covered while appendices include tour dates and a discography, as well as a map showing the important sites for any future visitors. Several myths are also laid to rest, many fans trekking to Montreux visit the wrong Grand Hotel altogether, while down the road the wealthy owners of luxury apartments sit blithely unaware of the music history made in their living rooms. This book follows Easy On The Eye’s previous Deep Purple book Wait For The Ricochet, which told the story of the band’s formation (it sold out the first print run in weeks but a second edition is now in stock). As before it is written in a way which will appeal both to the casual rock reader as well as the more informed fan. What people said about our last rock book. “Easy On The Eye books is well named; leaving aside its contents, the look and feel of this beautifully designed book make it hugely attractive just as an object.” Record Collector Magazine. “A wonderful book.” Steve Rosen, Curled Up. “Flawless and immaculate…” Rockpages, Greece. The authors: Simon Robinson has been closely involved in the ongoing archive programme overseeing many of the reissues of the group’s classic back-catalogue and live recordings. He has written extensively on the group’s history for magazines around the world as well as CD booklets. Stephen Clare worked on the previous book and has been heavily involved in research and tracking down people close to the actual events. The publisher: Easy On The Eye Books produce good quality books on post-war popular culture and music related subjects. The books, designed in the UK and printed in the EU, also carry the prestigious Made In Sheffield logo, awarded to companies who support local businesses (and last seen on the Richard Hawley produced Tony Christie album).